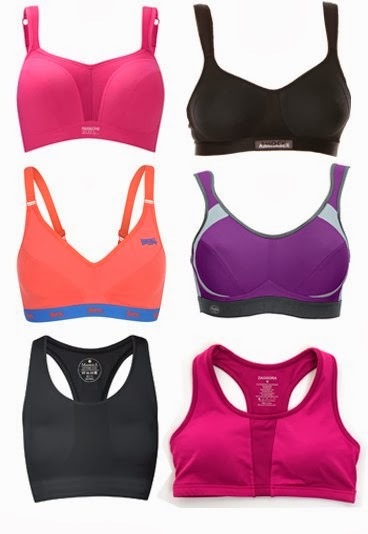 Whether you’re a B, C, D and/or above cup you need to always wear at least two sports bras when exercising, especially, when doing high impact workouts. As we run, jump, bounce our breast are feeling the impact. In turn creating micro tears (yes tears) in our breast tissue, which contributes to sagging. And NOBODY wants saggy, belly button reaching boobies. If you are shooting for wearing two sports bras the first bra (the one next to your skin) should be your typical go to bra size. The second (outer) bra should be one size larger in the band and one size smaller in the cup. As with all bras as you go up in circumference you go down in cup size. The goal here is little or no movement (bounce) when you run, jump, etc. I personally wear three bras. My first being a Genie or A-ha bra, then two underwire sports bras. This is a very personal preference and obviously it has to work for you with the “no bounce” goal. Both make very supportive bras that can be worn as sports bras. DON’T FORGET WEAR AT LEAST TWO! Supplements...What Are They Really Good For?